Grid size - Each individual grid can be sized per X and Y. The parameters are in the same units than the defined in the Setup Dialogue. Show grid - To display the grid on your Canvas, check this box. 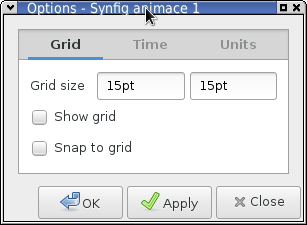 Snap to grid - To snap objects to precise points on the grid, check this box. NOTE: Options for TIME and UNITS tabs have not been implemented yet. This page was last modified on 20 May 2013, at 03:56.